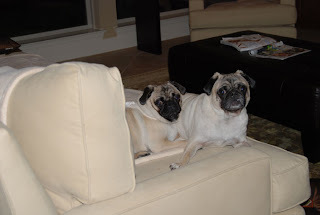 We love our new Seabury sofa from Pottery Barn…PB should ask us to model for them! So comfy…we hang out here all day! We snack, nap, and play on the sofa…the feather down is soooooo soft. We hang out whereever we want which these days is on our new sofa…we like to drag all our toys everywhere in the house and then get food on the sofa…so nice not to have to be primitive and lay on the floor! Brownie looks cute in everything! I know every pug momma probably feels that their little puggy is the cutest big eye treat and toy beggar…but I really think Brownie is the cutest one of all! His eyes are so big they sometimes look like they want to pop out when he is not feeling well. He’s like a pug cabbage patch kid baby. My sweet Browner…Porky is cute, too, but definitely the big macho dog and leader of our house. 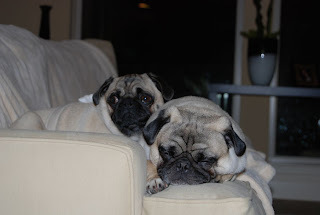 Going to the pug meetup and going on pug playdates have become a favorite activity in our house. 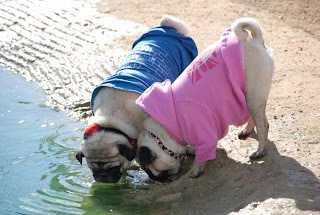 Here is the boys getting some water after they ran around the dog park at last month’s pug meetup. Fellow Houston Pug meetup puggers, sorry it took so long to get the pictures…we all got lazy around the holidays and pug’d out! Porky and Brownie’s big snuggly snake filled holiday! Porky, aka Pug Security Guard, pulling a holiday shift and keeping an eye out on new neighbors who just moved in across the street. Brownie enjoying his toys as usual in our home office while Momma is working at the desk. 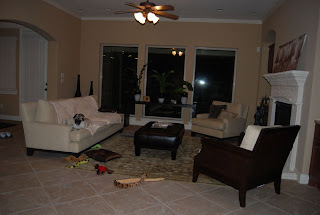 Did I mention Brownie will not lay on the floor and insist on either sofa or pillows or best of course, tons of pillows on feather down sofa. Snakes, snakes, and more snuggly snakes! I love toys! I don’t care about toys except to taking them away from Brownie. Do what you will to me, I am SOOO sleepy…more treats?